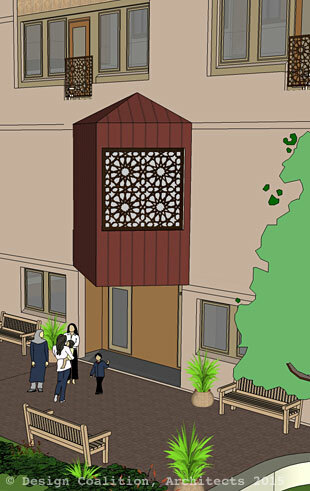 The Islamic Center in Madison, Wisconsin has been a campus hub for students and faculty and their families for decades. 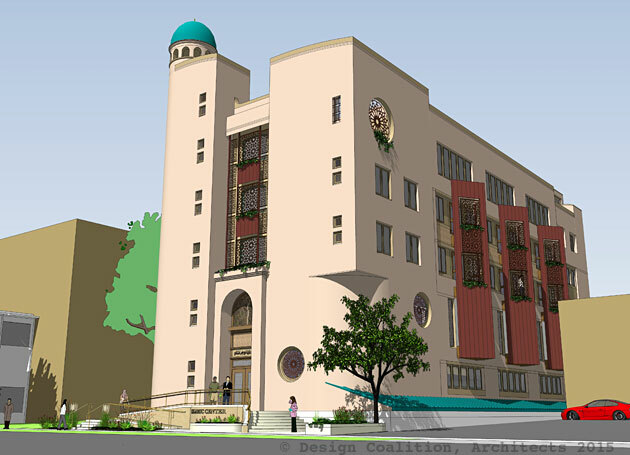 The Muslim community has been growing in the city however, and the current modest 2-story frame structure (below) just isn't big enough anymore. Available land near the University of Wisconsin campus is in very short supply, and so despite years of searching for an alternative, the Center has decided that it must remain on the current property. It's in a great location, but quite small. 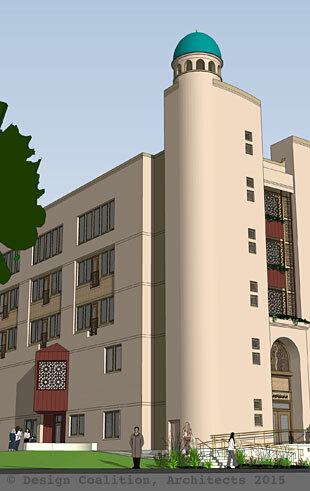 The congregation wants a new building that, unlike the current structure, has a recognizable "Islamic" look and feel, even as they also prefer this interpreted in a genuinely contemporary American architecture. From an architect's persepctive, this is an irresistable design challenge. We'll find out if the dome atop the stair/elevator tower survives through to the final version; Madison city planners love it, but some congregation members are less keen. The key space-planning challenge became obvious early on: to create larger worship space for the expanding congregation, but do it on the same narrow lot. (There is an additional Madison-specific irony here that locals will smile at: streets of the central portion of the city are layed out at a ±45-degree angle due to the lakes, a nearly ideal alignment for correct qibla orientation. However, this particular property happens to be, frustratingly, aligned true to the compass points). The building geometry necessary to accomplish the qibla orientation is the primary factor around which the rest of the architecture is shaped. The projections at the sides of the building are actually the corners of the main mosque worship space. 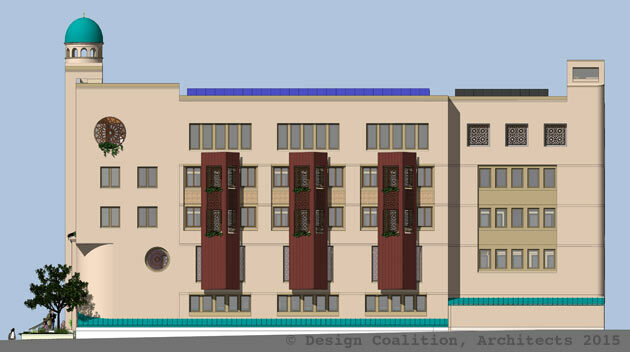 Those at the South (below) are extended up to form balconies at each of the apartments. Pierced metal screens on balconies with planter boxes recall the wooden privacy screens and the lush vegetation familiar to streetscapes of historic –and warm-climate– Middle Eastern cities. 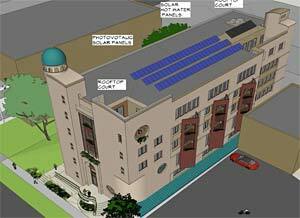 expanded multi-purpose facilities for such community events as graduations, weddings and funerals.